So you want to run a go demonstration for Learn Go Week (“Learn Go Week” Planned to Launch September 13 7/19 EJ), but aren’t sure what to do? You’re not alone. 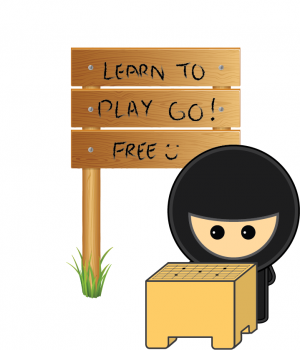 Since proposing Learn Go Week in July, the folks at Go Game Guru say they’ve received more questions about this than anything else. “The good news is that it’s not that hard, and we’ll work with you to make it as easy as possible,” says GGG’s David Ormerud. They have customizable posters,brochures, printable go sets and much more ready for you to use. Some 15 events are planned so far in half a dozen countries. Read more here. Reminder to players in last week’s US Open (or Masters Division) tournaments to send in your game record(s) and we’ll add it (them) to the official US Open crosstab. Thanks to Anders Kierulf (at right), Keith Arnold, Andrew Hall and William Luff for sending in their games. Games must be in sgf format with all game info complete, including both players’ full names, and the round number(s); also be sure to name the file in this format: US-Open_Rd1-Su-Kierulf (white player first). 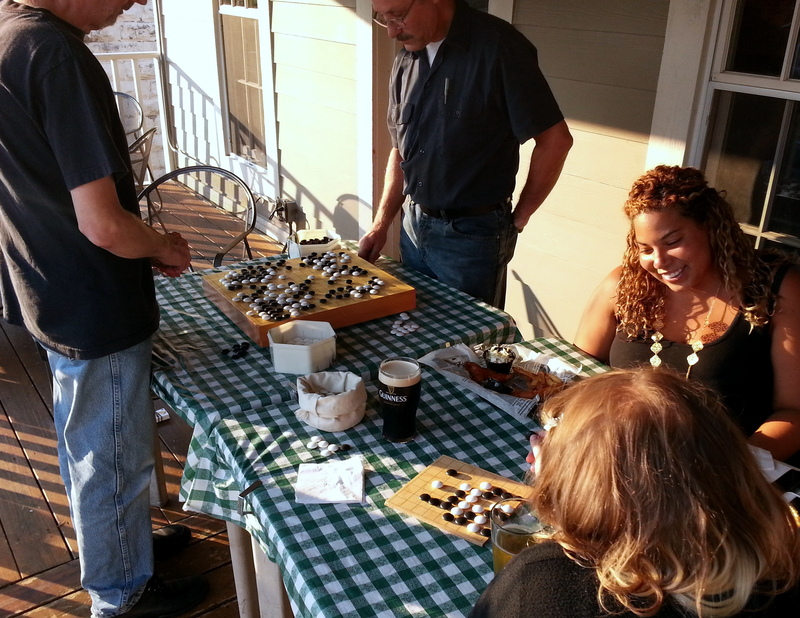 Email game records by this Friday, August 22 to journal@usgo.org. These cuff links are made from beautiful Japanese go stones with sterling silver posts. The set includes one white and one black cuff link. The white stone is Hinata clam shell from Japan. The black stone is Japanese Nachi Kuroishi slate. Please visit my Etsy store to purchase. The 2014 E-Journal Congress Team provided expanded coverage of this year’s US Go Congress, from top player previews before a single Congress stone was played to live online broadcasts of top boards at all nine rounds of the new US Open Masters Division, as well as more in-depth reporting on other non-US Open/Masters Congress tournaments. This year for the first time the EJ added social media, posting lots of updates and photos on Twitter @theaga and on Facebook, attaining an almost 10,000 reach on Facebook over the course of the week, an impressive 600% increase. Click here for all the EJ Go Congress reports. 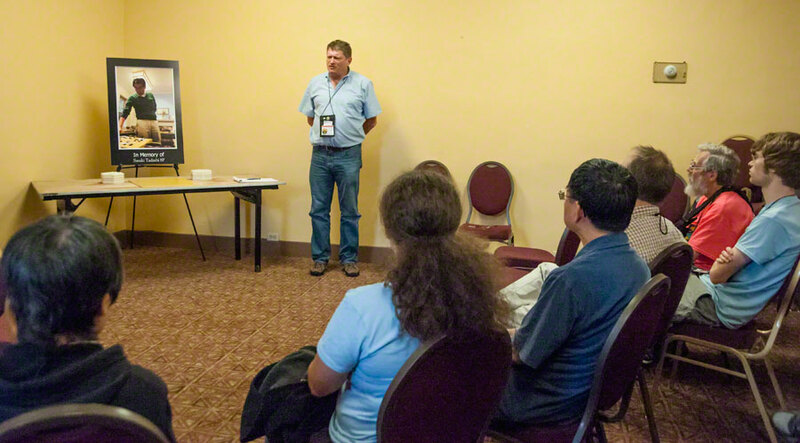 This year’s EJ Congress team was led by Managing Editor Chris Garlock, with Todd Heidenreich, Assistant Managing Editor and Steve Colburn, Tech/Game Recorder Support. Joining the team this year was Tournament Liaison/Reporter Karoline Li, who brought much-needed depth and breadth to the EJ’s coverage of other Congress tournaments. Paul Barchilon once again coordinated youth coverage, including both EJ reporting and KGS broadcasts of youth games. KGS continues to be a tremendous partner, with admin extraordinaire Akane Negishi (sweety) and her team of KGS admins, including Sadaharu Wakisaka onsite at the Congress. Masters Division games with audio commentary are available for a limited time free on KGS Plus; look under “Recent Lectures” under USGO5. The EJ game recording team was anchored as usual by the indefatigable Dennis Wheeler, who, along with Richard Dolen and Nathan Borggren, broadcast the morning US Open Masters Division games. The evening broadcast team included Andrew Jackson, Bart Jacob, Dave Weimer, Nate Eagle and Diego Pierrottet, as well as Wheeler, Dolen and Borggren. Solomon Smilack was on the evening recording team and also did the Friday night live pro commentary simulcast. Photographer Phil Straus did his usual fabulous job capturing indelible images of the Go Congress, and this year we were able to feature many more of them in a terrific series of albums on the AGA’s Facebook page. Sarah Small covered the Pair Go tournament and her album is also posted on the AGA Facebook page. Many thanks to the professional go players who participated in the E-Journal’s live audio commentaries on KGS this year; this was a new and very well-received effort, thanks to He Xie 9P, Feng Yun 9P, Myungwan Kim 9P, Jungsang Park 9P, Yilun Yang 7P, Jennie Shen 2P, Stephanie (Mingming) Yin 1P and Shirley (Xuefen) Lin 1P. Thanks to Pro Coordinator I-Han Lui for smoothly coordinating everything and to Daniel Chou and Kevin Hwang for translations. Special thanks to the tournament directors who worked hard on the Congress tournaments and worked closely with the EJ team to report results throughout the week: Chris Sira for the US Open; Boris Bernadsky, Jon Boley, and Chris Kirschner, US Open Masters Division; Joshua Lee for 9×9; Jim Hlavka for 13×13; Keith Arnold for the Lightning; Todd Heidenreich for Pair Go; Will Lockhart for the Die Hard; Lisa Scott for the Women’s Tournament; Nader Goubran for Midnight Madness; Michael Fodera for the Self-Paired; and Terry Benson for Crazy Go. - photos (and collage) by Phil Straus, except for the photo of Straus, which is by Steve Colburn, and the photos of Hwang and Pierrottet, by Chris Garlock. 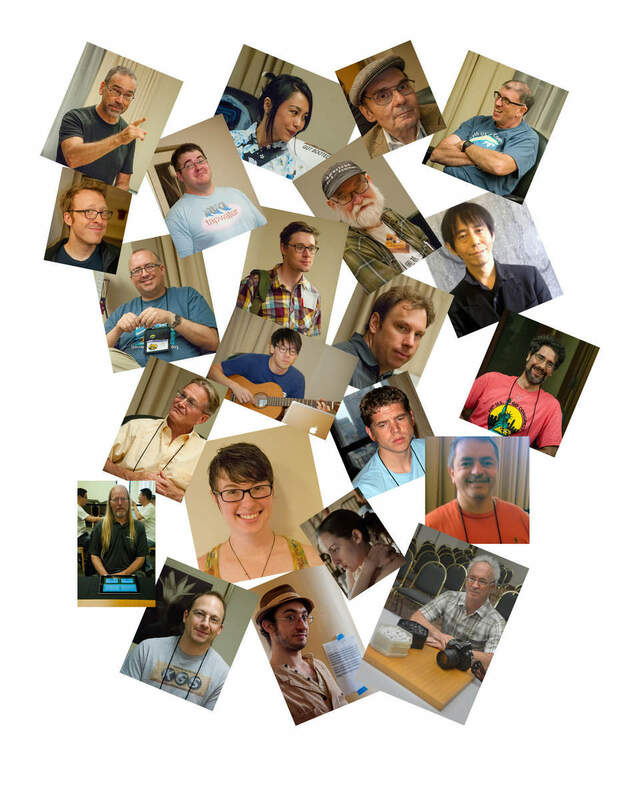 Photo (top row, l-r): Garlock, Negishi, Dolen, Jacob; second row: Jackson, Colburn, Wheeler, Wakisaka; third row: Heidenreich, Sira, Borggren, Barchilon; fourth row: Weimer, Kevin Hwang, Nate Eagle, Diego Pierrottet; fifth row: Boley, Li, Small; bottom row: Smilack, Bernadsky, Straus. A large crowd of somber friends shared memories of a great teacher at a memorial held last Friday evening for Sasaki Tadashi 8P, who died last month at 51 (In Memoriam: Sasaki Tadashi 8P 7/28 EJ & The Power Report 7/30 EJ). Players loved the bubbly humor underneath Sasaki sensei’s stoic exterior. Teaching never seemed like work to him, such was his love of the game. Players will also remember him for Baseball Go and his way of comparing territory to countries. During simultaneous games he would give away stones for komi when students made mistakes, and ask for it back when they made good moves. Sasaki sensei brought a lightness to go in the US, and he will be missed. Send in your US Open (or Masters Division) game record(s) in sgf format with all game info complete, including both players’ full names, and the round number(s), and we’ll add it (them) to the official US Open crosstab. Email game records – by Friday, August 22 – to journal@usgo.org. 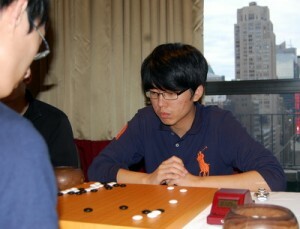 US Open: top winners (6/7D): 1st: (tie) Xiaotian Hu & Xuyu Xiang; 3rd: Daniel Chou; click here for complete winner’s list. NEW THIS YEAR: Send us your US Open game record in sgf format with all game info complete, including both players’ full names, and the round number, and we’ll add it to the official US Open crosstab. Email them – by Friday, August 22 – to journal@usgo.org. NOTE (8/17): the US Open results PDF has been updated to the correct final report and the 9×9 dan winner has been added. 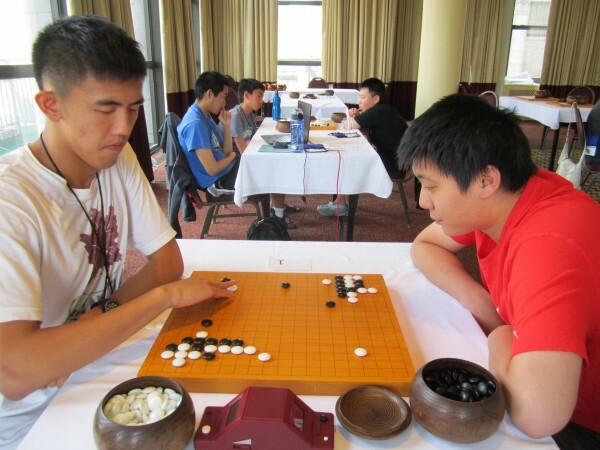 Bill Lin 7d and Aaron Ye 6d are the winners of the Redmond Cup, after a series of online matches, and then a live final at the US Go Congress. In the Junior Division (under 13) Ye, who has held the Redmond title for the past three years, made it clear he has no intention of giving up his title. He won all five rounds of the online qualifiers, and then cemented his status with two wins in a row against runner up Jeremy Chiu 6d, who lost on time in round 1 on Sunday, and then was defeated on the board again on Monday. Both boys are 12 years old. 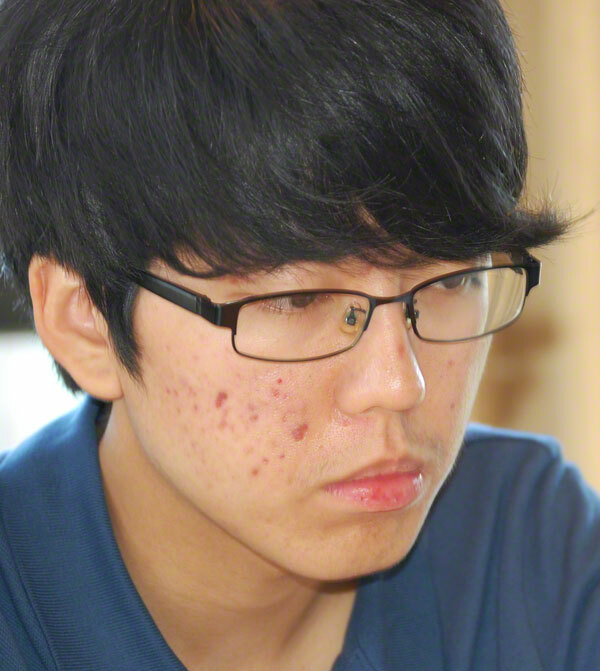 In the Senior Division (under 18) Bill Lin was undefeated in the six round qualifiers, but then stumbled in the first round of the finals, losing to two year reigning champ Jianing Gan 7d on Sunday afternoon. He came back fighting strong on Monday though, winning that round, and then claiming the title with a second win on Thursday. Matches from both divisions were broadcast live on KGS, and hundreds of viewers watched the games. 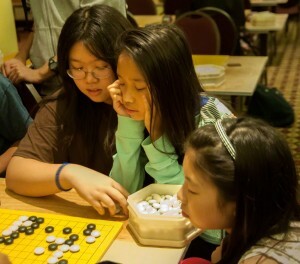 Friday’s big event in the Youth Room at Congress was the Youth Team Tourney, where teams of three compete against each other, just like in Hikaru no Go. 16 teams competed, 48 kids total, in both dan and kyu brackets. Top honors were won by Zhen Xianan 7d, Yifei Gao 6d, and Xinying Jiang 6d (with Aaron Ye as the alternate on one match). In the Kyu Division, Patrick Zhao 10k, Kilin Tang 12k and Daniel Zhao 14k won first place. All six received prizes in the Youth Room, as a well as a trophy at the awards banquet, and a free one month membership for Baduk TV. - Story and photos by Paul Barchilon E-J Youth Editor. 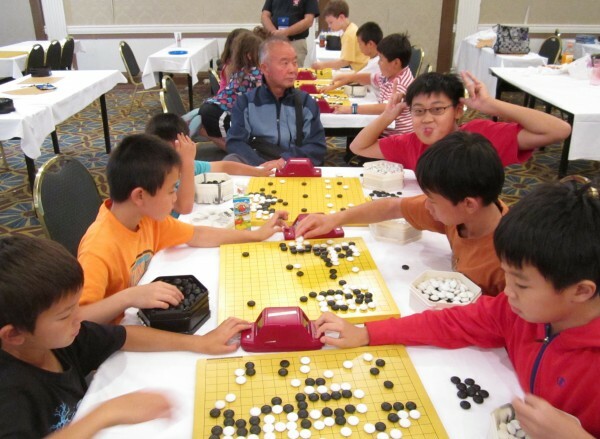 Top: Bill Lin 7d vs. Jianing Gan 7d in the Redmond Cup finals; Bottom: Kyu Division winners in the Youth Team, at right, demonstrate the advanced strategy that won them the match. US Open players undefeated through five rounds (also with one final round left to play Saturday morning): Fan Chen 5D; Nick Blake 3D; Dan Alvira 2D; Gilbert Feng 1D; Yukio Ishiyama 1D; Erik Brummelkamp 4K; Dmitry Dimatov 5K; Adam Jiang 7K; Joe Suzuki 7K; Matthias Kramm 9K; Ann Wu 10K; Mackenzie Brown 10K; Mark Nahabedian 13K; Dowson Yang 20K; Gary Smith 24K. Click here for US Open crosstab results. Longtime go player Steve Barbieri 1K was the high bidder at the traditional Friday night auction of a go board to benefit the American Go Foundation, his $1,000 bid winning a fierce bidding war for a two-inch kaya board signed by all the professional go players at the Go Congress. 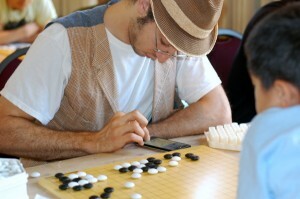 Barbieri was clearly inspired by AGA President Andy Okun’s example: he became shodan after winning the auction in 2008. “This kind of generosity is what’s enabled us to continue helping grow the game of go across the United States,” said AGF President Terry Benson. ““This contribution will cover one of the AGF college scholarships!” The auction, conducted as usual by American Go E-Journal Managing Editor Chris Garlock and Terry Benson, followed a live game commentary by Jungsang Park 9P and Myungwan Kim 9P on the Masters board one game between Lee and Liu. As usual, the board was donated by Yutopian. 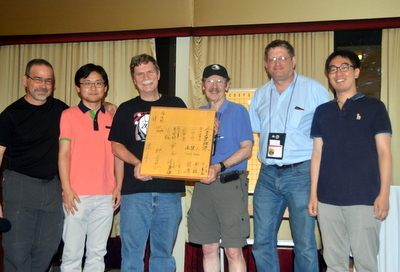 photo (l-r): Chris Garlock, Myungwan Kim 9P, Steve Barbieri, Terry Ben son, Andy Okun and Jungsang Park 9P; photo by Steve Colburn. Matt Mo 10k defeated Jim Fienup 3k in the 9×9 Tournament final on Friday to win the kyu championship; Dirk Riedeman 3D still has to play Zheng Xiangnan 5D for the dan championship. In the 13×13 Tournament, April Ye 1D beat Gabriella Su 5D to clinch the dan championship, while Jeff Wu 5k is still to face Ann Wu 10k in the battle for kyu champion. In the Lightning Tournament, the dan finalists have yet to be determined, but Yukino Takehara 1k has advanced to the kyu finals and waits for the winner of a semi-final game to play for the kyu championship. In the Self Paired Tournament, just 129 games have been played, with Matt Pruner 4D leading in Most Games Played, with 12. No other prize category leaders were available at press-time Friday night. - reporting by Chris Garlock and Karoline Li; bottom right photo of kids playing a casual game Friday night by Phil Straus. Click here for his latest album of Congress photos.